With nice Ox Blood red colour. And ornate cut out work to the handle. 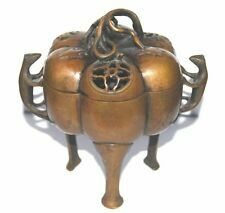 A Lovely Antique Chinese wood Basket. The basket is bound with two brass bands and is made of sections of wood. Fabulous antique wooden grain scoop dating from the 19th century. Good antique condition with just minor nibbles to the wooden edge of the scoop. 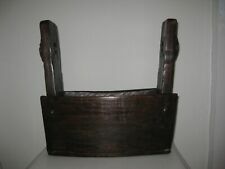 Fabulous antique wooden grain basket dating from the 19th century. It's a narrower one than often seen and would hold magazines nicely. Across by 175mm. tall by 154mm. 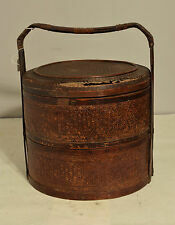 Beautiful Versatile Antique Rustic Chinese Well Bucket. This is a beautiful, tactile Chinese water bucket - very rustic & charming and could be used both indoors or out. This lovely bucket has a multitude of uses. There's a little bit of pitting which I have tried to clean. In good condition for its age. It is made of lacquered wood and woven Bamboo that has been painted and decorated with black and gold designs. above the top of the basket. The overall condition is good, subject to the normal wear and tear expected.Ref ETOP OF HEX D.
An antique/ vintage Chinese wicker sewing basket. The lid, which has glass ring handle, is also decorated with tassels and beads. The basket measures approx 21cm in diameter x 7cm high. The basket is in good condition: very little wear at all. An antique/ vintage Chinese wicker sewing basket. The lid, which has glass ring handle, is also decorated with coins and beads. The basket measures approx 21cm in diameter x 7.3cm high. The basket is in good condition: very little wear at all. Unusual novelty graduated set of 3 Chinese handmade lacquered rattan & bamboo baskets in the form of double sided eagles with glass eyes and large beaks. Beautifully detailed set which fit snugly into each other. 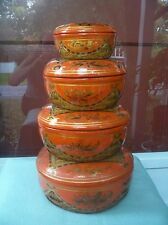 Lovely Chinese wedding basket with painting to lid. A great gift for a wedding ?. 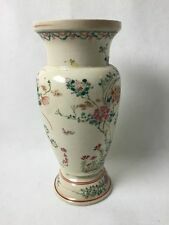 Not sure on age but nice item. Ecoforce Recycled Peg Basket With 24 Pegs [Single] (5 Pack). The height is 24” and the width is 17” and the length is 16”. There is a hole in the top wicker lid. This is a wonderful, early 20th century antique, Chinese sewing basket. It is in very good used condition. This would be a lovely addition to any Orientalia collection. THIS IS A SET OF FOUR (4) BASKETS THAT ARE GRADUATED IN SIZE AND ARE LACQUERED IN RED AND ALSO GILDED IN GOLD LEAF. THIS IS PART OF MY FAMILY ESTATE AND WERE A GIFT AT MY FAMILY'S WEDDING. There's no marking that I can detect that would suggest its origin but attached is a 5 cents coins circa 1938 from the region/period. More photos are available; just ask. Product is approx. 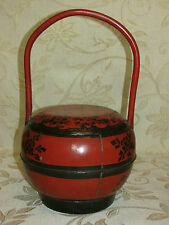 6" w x 2.5" d x 4.5" h.
Red Lacquer Carved Wood Utility / Water Hanging Handle Bucket. Shows signs of age / use / wear / imperfections from manufacture. Overall the item is still in good condition & is a nice old looking antique bucket. Vintage Chinese Wicker Sewing Basket Tassels Beads Coins Needles Pin Cushion Misc inside. In good condition with light wear - the base does not sit perfectly flat. Measures 12" across, 5 1/2" high. 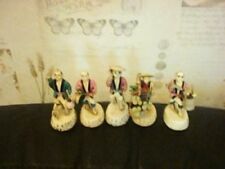 Both pieces are decorated with butterflies and flowers and birds and people. The condition of these pieces is very good aside from a few very tiny nicks under the foot of the basket. This is a beautiful TwoTier Antique Chinese Wedding Basket. It is made from split bamboo and closely woven willow fiber. Each layer has a wooden base. The walls and top of the box are composed of two separate layers of weaving, which provides strength and rigidity. You are looking at an Antique Chinese Bamboo & Wicker Basket w/ Poem & Longevity God. I believe it was made in the late 1900’s. With the handle, it’s 18.5” tall. Without the handle, it’s around 9” tall. 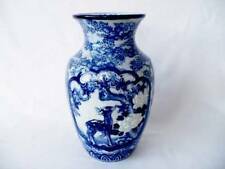 This is an Antique Chinese Export Blue & White Canton Porcelain Reticulated Basket. The basket has an oval base with under-glaze blue decoration depicting a temple and lake scene. The basket is 10" across, 8 1/2" wide, and 3 1/4" deep. Antique chinese wedding basket. Hanging loop is not attached on one end, seen in 3rd photo. Could be secured with glue. Smoke free. Basket with Mural: 18" Tall (Top of Handle) 9" Wide at base. Beautiful Detailed Gilt Hand Paintings of Leafy and Floral Motifs On Top Rim and Cover. Black Lacquer Interior. with Cover and Bamboo Top Handles. Wedding Lunch Basket. Hexagonal Inlaid Wood Motif in the Center of the Cover. 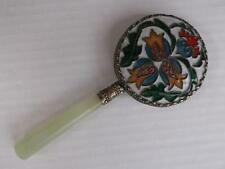 Antique Coins & Multi-Color Peking Glass Beads. 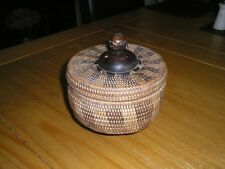 10" CHINESE SEWING BASKET-. CHECK BACK OFTEN. This is a great addition to your collection, or would make a fine gift. Fine Condition - no breaks in the wicker. Type: Beautiful antique Chinese Traditional hand woven bamboo wicker basket, hinged lid, handle and wood closure clasp. Luggage shape. Material: Split Bamboo Wicker slats. Very clean on the inside, too. Basket itself is in very good condition.